DSC and digital pen market - Touch Display Research, Inc.
May 17, 2017 by Jennifer Colegrove Ph.D.
Today, Digital Stationery Consortium (DSC) announced more new members and the formation of three new working groups. Founded by Wacom in 2016, DSC is an association with the shared mission to advocate the value of digital pen, ink and paper. Touch Display Research had a chance to interview Mr. Faik Karaoglu, Officer of the Digital Stationery Consortium and Senior Vice President of Wacom’s Platforms and Apps Business Unit. We asked their relationship with Universal Stylus Initiative (USI), another industry association. (Here is the blog about we interviewed Mr. Pete Mueller, Chairman of USI and Principal Engineer/Senior Technologist at Intel.) Mr. Karaoglu replied that they are not competing, rather they are complimentary to each other. USI is focusing on hardware: the active pen; DSC is focusing on the software and usage cases. Digital pen input is very useful in education, certain language input, medical, finance, industry applications, and content creation. Active pen technology is superior to passive in terms of accuracy, pressure sensing, and input of fine line. 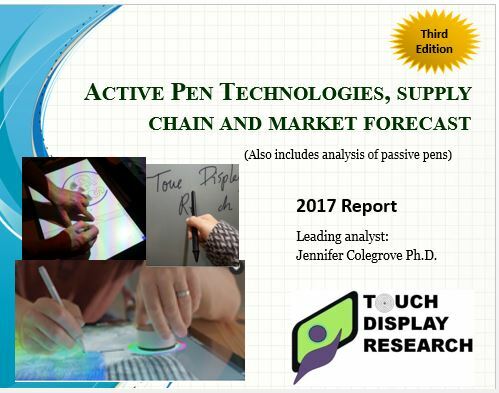 In the recently published “Active Pen Technologies, Supply Chain and Market Forecast 2017 Report (Third Edition),” Touch Display Research Inc. forecasted that active pen usage will have rapid growth in the next several years. The active pen market has attracted over 120 companies. We analyzed more than twenty digital pen technologies, which include thirteen active pen technologies and eight passive pen technologies. The active pen industry is going through re-shuffling, market shares of leading pen protocols are forecasted in this report. This entry was posted in Active Pen, Displays and tagged active pen, active pen 2017 report, active pen market, digital pen market, DSC, Mr. Faik Karaoglu, USI, Wacom on May 17, 2017 by jennycolegrove.